What started as a series of text messages between two friends with slightly immature tendencies for their age, led to the creation of “POOP THE WORLD”, the finest poop related application for the iPhone. We wanted to create a useful, humorous, and visually appealing (no real poop pics) high quality app that allows people to track their poop types, fragrances, locations, and statistics using the iPhone technology. In addition to these deep features, we also included some challenging achievements that will keep you entertained long after your first Baby Nessie. POOP THE WORLD is reminiscent of those sunny afternoons during your childhood when you would lie in the grass and look at the sky while making imaginary shapes from the passing clouds. Only instead of clouds, you are a grown adult, looking between your legs and trying to decipher whether you have just created a Baby Brown Manatee with the lingering fragrance of New Tennis Balls, or Ants on a Log with the distinct odor of Elk Musk. 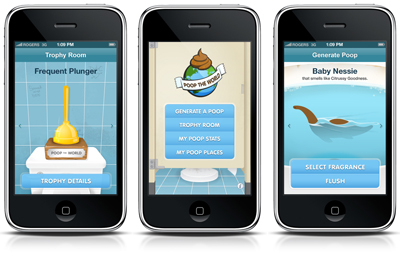 View real-time maps of poops being generated around the world, share over 400 poop & fragrance combinations with friends, and earn trophies for all your hard work! Check out POOP THE WORLD on iTunes.